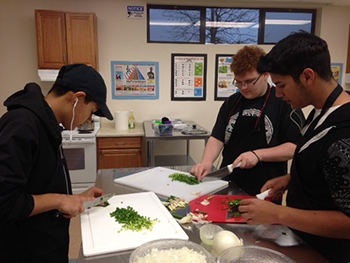 Pictured: Bryan Jimenez, Elias Brown, and Alexander Camancho practice mincing in Culinary Arts class. The El Dorado County Office of Education’s (EDCOE) Charter College & Career Prep began this school year with a myriad of new services that emphasize early college participation and success with hands-on learning experiences. The charter alternative program, located on EDCOE’s main campus in Placerville, combined their college and career programs to create more opportunities for students. The combination of the early college program and applied learning opportunities have proven very popular with the students. “Culinary Arts is great because it is a life skill and prepares us for adulthood. This is an opportunity that most charters don’t have. Here, we have good food and good people,” remarked student Noelle Green. The Advanced Education and applied learning programs at Charter College & Career Prep are examples of the many ways the EDCOE Charter Alternative Programs help guide students toward a successful transition into higher education and the workforce. Additional information about Charter College & Career Prep may be found at http://charter.edcoe.org or by calling (530) 295-2295.